The Missouri River once flowed northeasterly through this valley to Hudson Bay. During the Bull Lake Ice Age, an ice dam near Loma diverted the river into its current channel. This channel began filling with glacial sediment, preventing the river from returning to its original course when the dam finally broke about 70,000 to 130,000 years ago. Several sections of the highway between Loma and Havre follow Big Sandy Creek, which is located in the old river channel. From this point, you also have a panoramic view of the drainages of three major Montana river systems: the Teton, Marias, and Missouri. To the southwest, the Teton and Marias Rivers merge near Loma before joining the Missouri about a mile downstream. In the background are the Bear’s Paw Mountains to the east, Square Butte and Round Butte to the southeast, the Highwood Mountains toward the south, and the Little Belt Mountains in the southwest. 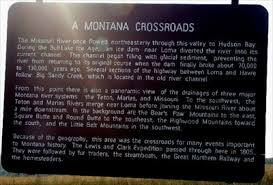 Because of the geography, this area was the crossroads for many events important to Montana history. The Lewis and Clark Expedition passed through here in 1805. They were followed by fur traders, the steamboats, the Great Northern Railway and the homesteaders.